The Dutch side were hamstrung when they were informed just minutes before the game that a new equal rights ordinance passed by the City Council of Amsterdam required that 50% of the players from the Ranstad Conubation be openly homosexual. The team was in Buenos Aires, preparing for the World Cup final when word of this new city regulation, which also applied to any government or publicly sponsored activities by Conubation citizens outside of the Netherlands, was relayed to them. Reluctant to lose his best players, coach Rinus Michaels hastily recruited a quartet of gay Amsterdam natives then in Buenos Aires as part of a touring company of the musical production of Ik Jan Cramer. In accordance with the new city ordinance, the homosexual players had to have their sexual preference announced over the public address system in both Dutch and Spanish in the Stadio Monumental before the game. The Argentine military, which had ringed the pitch to keep already unruly Argentines from storming the playing field, immediately abandoned their posts, leaving the field to be overrun by Argentine fans who taunted the gay players. The Royal Netherlands Football Association filed a formal protest with FIFA. The protest was dismissed. The Dutch team squandered an astonishing 38 open net shots and six penalty kicks in the second half. The German goal keeper had been injured in the first half, and the back-up keeper had been sent off for viciously fouling Van Van Der Overhesserlink in the 47th minute. Van Der Overhesserlink missed the penalty shot, the first of six penalty misses in regular time, all of them shot with a German fullback playing in the goal. When the game went to penalty kicks, the Dutch players were so nervous they drew straws to see who could opt out. In a now famous photograph which has done much to lessen the repuation of Dutch football, the first five losers, including Van Der Overhesserlink, were actually shown to be in tears at the prospect of taking their shot. One player, Willem Witten-Neeskenslitter, passed out on the pitch and had to be revived before his own try, which he missed, despite 62-year old German assistant coach Berti Model now keeping goal for the Germans. The Germans converted on their first three kicks to win. After the match, the Royal Netherlands Football Association elected to re-hire Rinus Michaels. With the Dutch needing either a win or a draw to qualify for the 2002 World Cup, the team led by 7 goals with 82 seconds left in the match. Gritty Faroe Islands scored eight goals, the last two on own goals scored by Dutch defenders. Following the match, The Royal Netherlands Football Association released a statement explaining that racial tension on the team had been the cause of the problem. The Association also announced the rehiring of coach Van Gall. Having dominated the group stage, the Dutch stormed through to the semi-final only to meet a determined Italian squad that had perfected the football dive and was executing it as well as any team in history. With the Dutch leading 1-0 and just a minute to go in extra time, Italian mid-fielder Gianluigi Ditotti fell in the penalty area. Replays show there was no Dutch player within 22- meters of him. Italy converted the awarded penalty kick and would win on penalty kicks after extra time. The Royal Netherlands Football Association did not release a statement or file a protest. The Lancaster, Pennsylvania Boys Club had volunteered to attend the Amsterdam Olympics as the US soccer representative, and this team of 12-year olds performed admirably, making it to the semi-final by defeating Abbysinia 1-0 and Egypt 3-2. But in the heavily favored Dutch, it was assumed the Boys Club run woujld come to an end. Alas, the Boys Club, led by Center Forward Jack Tate, scored a quick goal and the resulting Dutch squabbling ended with half the Dutch side resigning during the 28th minute. Coach Joris Blink was then able to field just his nine remaining men. However, another argument after Tate broke through to score again, resulted in the resignation of the remainder of the Dutch side. Olympic offficials declared the game over in the 72nd minute when the Dutch were unable to field a squad. 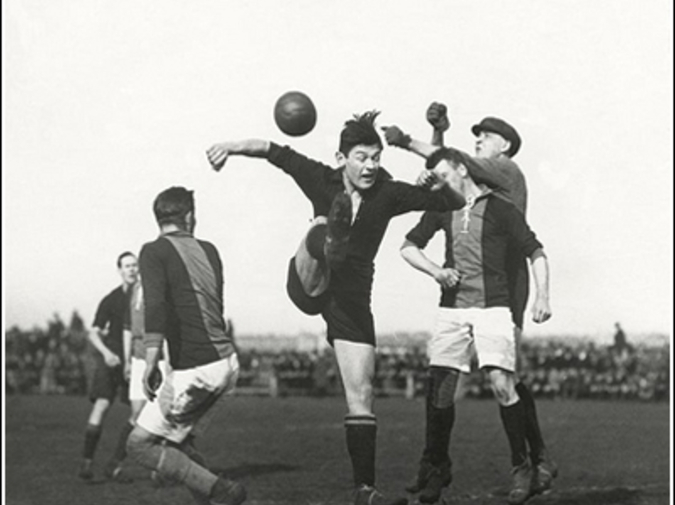 In the wake of this match, The Royal Netherlands Football Association was formed to regulate Dutch soccer so that this type of humiliating loss would never be repeated.